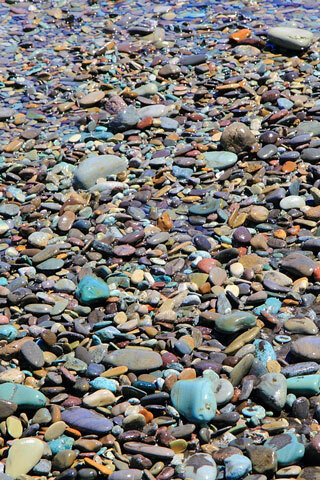 Photo: The famous aquamarine pebbles of Ende. This striking beach is composed almost entirely of unusual turquoise, pastel blue, and reddish stones, a geological marvel. The scenic 25-kilometre drive northwest from Ende on the road to Bajawa takes about 30 or 40 minutes, and passes by green canyons tumbling into the sea, gorgeous black strips of sand, and colourful villages occupying space that would be taken up with overpriced beach resorts in most other parts of the world. You’ll see the Blue Stone Beach from the road before you get there: make a left off the main road to reach the water, where you’ll likely be approached by friendly and somewhat bored kids and teens if you come after school hours. Swimming here is fine, although it’s likely best if you keep some clothes on to avoid offending local sensibilities. The stones make a special rattling sound as the tide washes over them -- huge blue-greenish cliffs reaching the sea here hint at their origin. You can view the green and often misty mountains of Bajawa to your right, facing the ocean. Ende locals feel their blue stones will someday become something of an international commodity, but as for now, this gorgeous strip is all yours. Browse our independent reviews of places to stay in and around Ende. Read up on where to eat on Ende. Check out our listings of things to do in and around Ende. Read up on how to get to Ende. Planning on riding a scooter in Ende? Please read this. See below for more sights and activities in Ende that are listed on Travelfish.org. Where are you planning on heading to after Ende? Here are some spots commonly visited from here, or click here to see a full destination list for Indonesia.